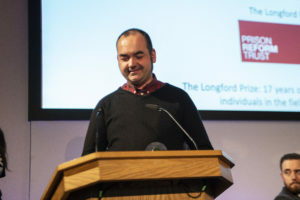 The Longford Prize celebrates the achievements of individuals, groups and organisations working in the field of prison reform. It is awarded annually by the Longford Trust from nominations made by the public, and recognises qualities of humanity, courage, persistence and originality. It is worth £5,000 and those honoured receive their awards (pictured above and designed by former Longford Scholar, Ben Levings) at the annual Longford Lecture. Past winners include: Circles UK, The Clink, Inquest, Prisoners’ Abroad and HMP Grendon. It is sponsored by the McGrath Charitable Trust. The winner of the 2018 Longford Prize was Haven Distribution, a volunteer-led organisation which for the past 22 years has distributed tens of thousands of books to every UK jail to prisoners desperate to engage in education. “Determinedly low profile,” our judges said, it is “a vital lifeline [of] constancy, durability and dedication”. 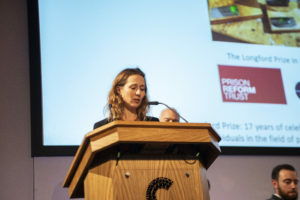 The judges in 2018 made an Outstanding Achievement award to Josie Bevan, whose Prison Bag blog “reaches the parts of the public debate that others can’t”, and Highly Commended the global human rights organisation, Reprieve, as “tireless and especially valuable”.